Sugar, spice, and everything nice: the charming Cavachon has got the right ingredients to make the cutest companion for any family. A fairly new designer dog to the canine stage, the first litter of Cavachon puppies made their debut in the US in the late 1990s when a Bichon Frise and a Cavalier King Charles Spaniel decided to get close and cozy. The result? A crossbreed that combines the best of both of these small sized, lovable breeds. If you’re looking for the perfect cuddle buddy that is fairly low maintenance, then the Cavachon might be right up your alley. Let’s take a walk through the world of the Cavachon and by the end of this article, don’t be surprised if your eyes have been permanently replaced with hearts. What Does the Cavachon Look Like? So, Where Can You Buy a Cavachon Puppy? Conclusion: Is the Cavachon the Right Dog for You? There is no need for guard dogs here! With the Cavachon, love is all you need. Here are 4 characteristics that are quickly making people fall head over heels for this pocket-sized crossbreed. Growing from 12-16 inches and weighing around 15-20 lbs, the Cavachon is considered a lapdog. Small dogs thrive in diverse environments, whether you live in a large house or a tiny apartment. For city folk aching for a dog but unsure about having enough space- the Cavachon would fit in fine with city life. Their size also makes it easy to travel about from one destination to another. So, if you’re an avid traveler, purchase a comfortable doggie carrier and tuck Cavachonie in for the trip! In fact, it got quite lucky with inheriting handsome locks from both of its parents. These characteristics make it easy to control sneeze-inducing dander. It is recommended to administer a thorough brushing three to four times a week to keep the Cavachon looking suave. If you were to trudge up snowy Mount Crumpit to the Grinch’s lair and present him with a Cavachon, his shriveled heart would undoubtedly grow triple the size once he looked into those big, round eyes. That’s the Cavachon effect; it’s a sweet-tempered dog that lives to be by your side or in your lap. For families with children, you won’t have to worry about aggression. Its calm demeanor makes it perfect for the whole family, and it gets along fine with other pets. The slight downside to having a dog that just wants to be with you all of the time is exactly that: you won’t be left alone… EVER. Now, maybe that’s not such a bad thing. I mean, who doesn’t want to constantly be surrounded by cuteness? The Cavachon tends to form an extremely close bond with its owner. If you work in an office all day or travel frequently for business, beware that the Cavachon does not like to be left alone and is prone to separation anxiety. Take a teddy bear with a button nose and silky, soft curls, then add a little pink tongue and wagging tail. Voila! Ok, so it’s a bit more scientific than that, but a Cavachon does resemble some ridiculously cute looking creature. As a hybrid, you won’t know what you get until your Cavachon puppy is full grown. You can get clues from its parents though. 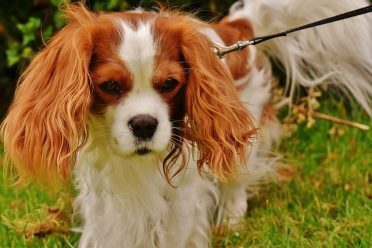 The Cavalier King Charles Spaniel is classified as a toy breed with a round shaped head, floppy ears and a long, silky coat that can be tri-color, black, and tan, ruby or blenheim. 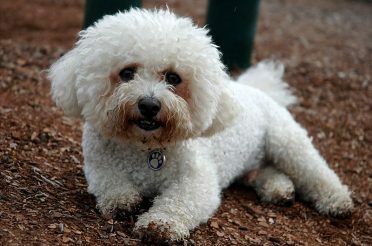 The Bichon Frise is of similar small build, but not considered a toy breed. It is characterized by its coat of tight, white curls. The Cavachon generally displays a mix of silky, wavy to curly fur. It comes in a dual-color or tri-color that consists of white, black, tan or apricot markings. Like both of its parents, the Cavachon inherited it’s beautiful, deep-set dark eyes that you can’t help but get lost in. As we mentioned before, since it is a hybrid, appearance differs from litter to litter. But, you can be sure that the Cavachon won’t grow large or weigh much and its fur will have some wavy texture to it. The size of an adult Cavachon can depend on a few different factors, such as the size of the parents and the generation. 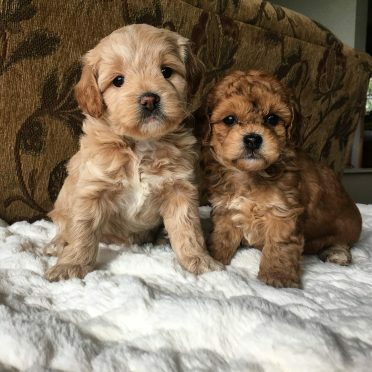 A second-generation Cavachon to Cavachon mix will produce a litter of Cavachon puppies smaller than the first generation Cavalier King Charles/ Bichon mixed puppies. The cuteness continues. These other Cavachon mixes might tickle your fancy. This is a tri-mix breed of the Cavalier King Charles Spaniel, a Bichon Frise, and a Miniature Poodle. When the Cavapoochon was created in 2001, breeders hoped that small size, a sparkly poodle personality, and everlasting puppy-esque features would make it a fitting service dog for therapy work. But, what sets the Cavapoochon apart from the Cavachon? With the added genes of the Miniature Poodle, the Cavapoochon exhibits a coat that can be red, apricot, cream, black/tan/white, black, black and white, sable, black and tan and white/apricot, white/red. The Cavapoochon has an extensive lifespan of 20 years, while the Cavachon lives 10-15 years. Such a diverse gene pool is said to lead to congenital defects and unpredictable personality traits, but this is still debatable with this new hybrid. The Cavapoo is another crossbreed that became popular in Australia in the late 1990s. It is the offspring of a Poodle and a Cavalier King Charles Spaniel. Bred for the same friendly and hypoallergenic characteristics as found in the Cavachon, both hybrids share very similar profiles. Both have a lifespan of up to 15 years and are around the same size in height and weight. 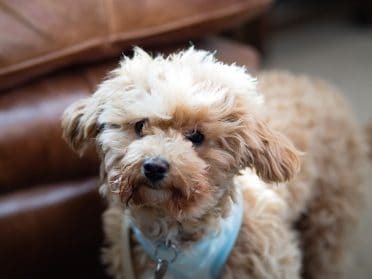 Once again it depends on the parents when it comes to crossbreeds, but the Cavapoo can have a rounder, more poodle-like face and shorter ears. Colors can vary, as the Cavapoo can be chestnut or gold. The Cavapoo suffers from health problems such as congenital heart disease and slipping kneecaps. A mixed genepool gives the Cavachon a health advantage over purebreds. They enjoy a long life with few health problems that aren’t fatal in most cases. Heart murmurs: These are extra heart vibrations that occur from a disturbance in the blood flow. Common symptoms include abnormal heart sounds, coughing or weakness. Eye ulcerations: This is a scratch on the cornea, which can be caused by many factors. For Cavachons, hair rubbing in the eyes is the main culprit. Ear infections: Ear mites, allergies, and wax build up are just a few of the common causes of infections in dogs. Clean out your Cavachon’s long ears weekly to avoid future problems down the road. Obesity isn’t a problem for the Cavachon, as small dogs boast fast metabolisms. Large dogs require 20 to 30 calories per pound of bodyweight, whereas smaller breeds require 30 to 40 calories. When feeding your Cavachon, keep in mind that they need a diet rich in protein and fat. Starting her out on dog food specialized for small dog breeds is a good option. For puppies, start with small breed puppy food. The Cavachon isn’t highly active, but like any dog, she needs her daily exercise. Embarking on a 30-minute walk every day is enough to keep her in glowing shape. They are also playful and won’t refuse a good romp with a ball out in the backyard. Just as well, when you want to relax on the couch, your Cavachon is content to sit in your lap and do the same. When it comes to temperament the Cavachon is as sweet as a peach. But with hybrids, it’s true that you cannot guarantee how a puppy’s personality will turn out. The Cavalier King Charles Spaniel is known for its playful and affectionate nature, while the Bichon Frise has a cheery disposition as well. This combo makes it difficult for the Cavachon to be anything but delightful. You can expect a dog that prefers to spend its days by your side. Whether you’re on the couch watching hours of Netflix or playing catch in the backyard, the Cavachon is satisfied, as long as she’s with you. That’s what makes this dog the perfect companion for children as well as older adults. We do recommend that you train your Cavachon for 30 minutes every day and focus on early socialization. This will help her to be calm, obedient and adjust easily to children and other pets in the house. Small dogs tend to have a reputation for being difficult to house train, but the Cavachon displays moderate to high intelligence and learns quickly. Training also prevents the development of small dog syndrome, which Cavachons are prone to without proper training. You’re probably at the point in this article where you’ve “oohed” and “aahed” at all of the Cavachon pictures and you’re dreaming of nights spent with a living teddy bear curled up in your lap. You want to know: are there any Cavachon puppies for sale and if yes, where I can get one? Cavachon puppies cost anywhere from $1,500 to $6,300 depending on breeding lines. Here’s a list of popular locations where you can find reputable Cavachon breeders. 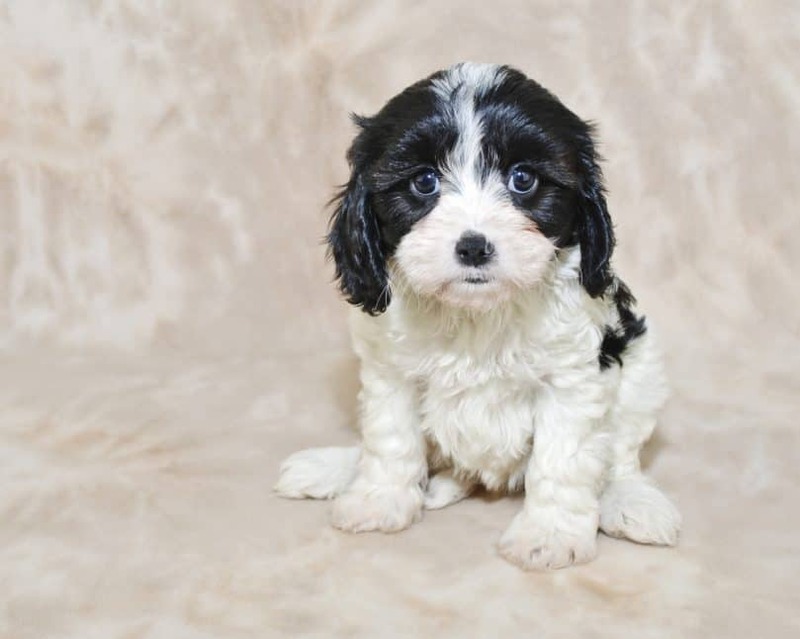 Greenfield Puppies: This accredited website showcases all of the best Cavachon breeders in PA and surrounding states (there are few dogs available in New York at the moment) in one place. They work with responsible breeders only and do not support puppy mills. Cavachon Puppies: You can feel the passion and love this family has for Cavachons when you read their story. They offer puppies for sale including lifetime support, medical records, shots and more. They are located in Indiana but cater to Florida and surrounding states. Foxglove Farm: This Cavachon lover has years of experience as a dog breeder, obedience trainer and veterinary technician. Silver Paw Cavachons: A responsible choice for a Cavachon breeder, with a health guarantee and plenty of information readily available to help first time Cavachon buyers. 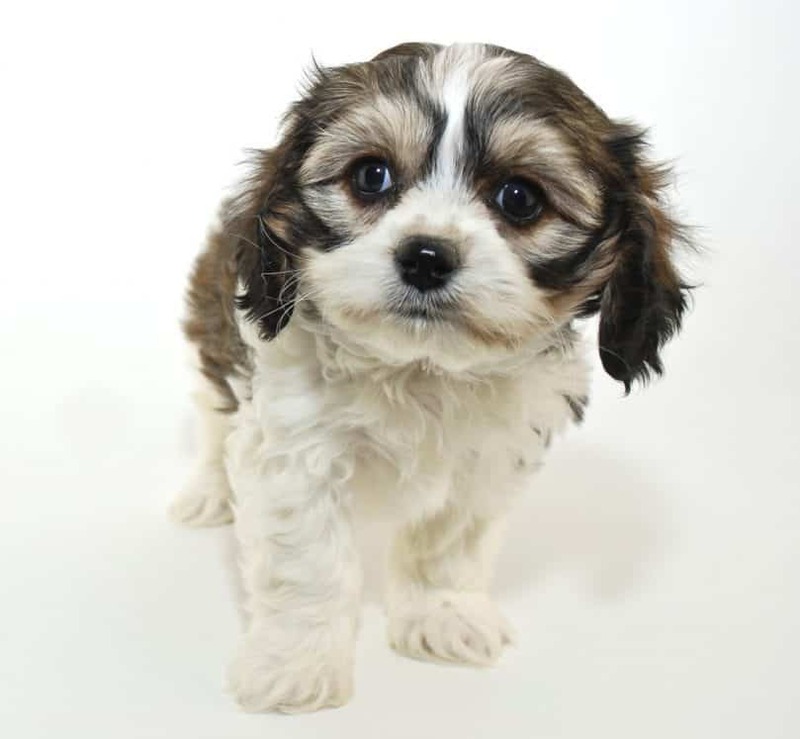 With the Cavachon breed rising in popularity in the US and not a lot of certified breeders available to meet the demand, puppy mills are taking notice. Many Cavachons are rescued from these horrid places and end up in shelters. Cavachon Forum: This Facebook page is dedicated to Cavachons. You can find adoption posts and connect with other Cavachon enthusiasts. 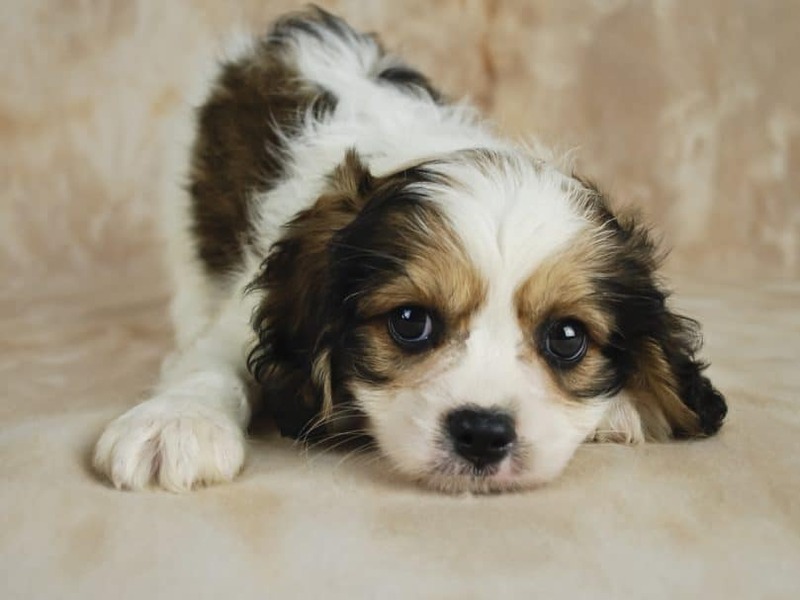 Fur Babies Rescue: These angelic souls rescue Cavachons and other dog breeds from puppy mills. PuppyFinder: This website lets you browse through thousands of dogs up for adoption nationwide. Check back regularly for Cavachons that are looking for their forever home. This designer dog is perfect for families with children and other pets. With its sweet temperament and small size, it’ll fit right in with its surroundings, no matter if you live in an apartment or even in the countryside. If you suffer from allergies or asthma, their hypoallergenic fur will let you cuddle up without much sneezing or shedding. Intelligent and not overly active, with a little bit of training, this crossbreed will stay by your side, displaying its best behavior. Beware that this dog doesn’t like to be left alone, so if you work long hours away from home or travel frequently, it can develop separation anxiety. Regardless, the Cavachon combines the best of the Cavalier King Charles Spaniel and Bichon Frise for a lovable, low maintenance companion that will always be the one to cheer you up with a wagging tail and a lick on the cheek. What do you think about the Cavachon? Is it the dog for you? Tell us in the comments! We brought home “Winnie” on 07/17/2018 from a reputable breeder at 8 weeks old. For the first E or four hours we left her alone on the couch. Was somewhat concerned that she was lethargic. Once she got used to the new surroundings the tail never stopped wagging nor did the kisses. Slept with dad (me )half the night since she woke up at 330pm crying. I know I shouldn’t have done that but…..
Shih Poo: Complete Guide on Shih Tzu and Poodle mix!